Geneva-- The World Bank Group’s health and climate directors released a report today establishing a new framework for health systems in every country to become leaders in addressing climate change. The report is a joint production with Health Care Without Harm (1). In its title, the report coins the term Climate-Smart Health Care, an approach that sets forth both low-carbon and resilience strategies. These strategies are designed for the development community, ministries of health, hospitals and health systems to deploy while addressing the health impacts of climate change. James Close, Director of the World Bank’s Climate Change Group and Olusoji Adeyi Director of Health, Nutrition, and Population at the Bank jointly write: "The health sector has a substantial role to play in both mitigating climate change through the adoption of low-carbon strategies, while also building resilience to climate impact." While few countries have undertaken healthcare carbon footprint measurements, and further study is necessary to more comprehensively quantify healthcare’s contribution to climate change, the report makes a rough, first-ever estimate of health care’s global emissions. It conservatively finds that health care generates 5% of world-wide greenhouse gas emissions, amounting to 2.6 billion metric tons of CO2e in 2011. 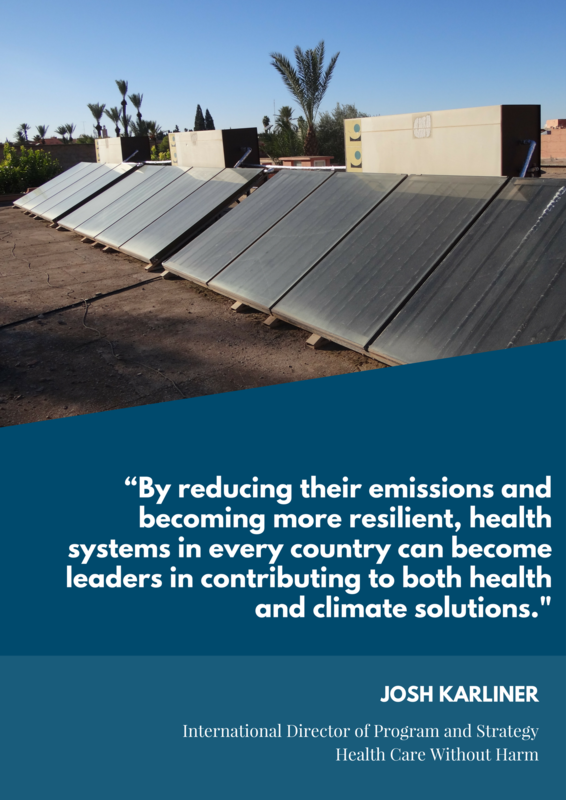 "By reducing their emissions and becoming more resilient, health systems in every country can become leaders in contributing to both health and climate solutions," says Josh Karliner, an International Director at Health Care Without Harm and one of the report’s authors. Health ministries can invest in affordable carbon reducing, health-focused initiatives in renewable energy, energy efficiency, local transport systems, sustainable and safe water use, safe waste disposal, and the purchase of locally and sustainably produced food. There are several co-benefits to climate-smart healthcare, including improved health through a reduction in environmental pollution and climate change, as well as more efficient, less costly health systems and stronger local economies. A climate-smart approach, including system design that decentralizes care, relying more on both prevention and telemedicine, can provide effective, cheaper care. In low-resource, energy-poor settings, powering healthcare with low-carbon solutions can enhance access to care, contributing to climate resilience and the advancement of universal healthcare for the poor and most vulnerable. Development institutions can support and fund health systems and sector actors to adopt key elements of climate-smart healthcare. Development institutions can advocate that industries in the healthcare supply chain develop low-carbon and environmentally sustainable manufacturing and distribution practices. disease-specific responses to address the changing burden of disease related to climate change. HCWH will continue to work in collaboration with the World Bank Group to develop and implement Climate-Smart Healthcare in institutions, in countries, and with health systems around the world. Climate change is already having real, measurable impacts on human health, and those impacts are expected to grow. Low- and middle-income countries are seeing the worst effects as they are most vulnerable to climate shifts and least able to adapt given weak health systems and poor infrastructure. The good news is that the cumulative impacts of climate change on health have been extensively discussed for decades and understanding is growing. Over the past three years, the WBG has worked in consultation with experts and development partners to establish a major program addressing climate change and health. The program has been built with two primary considerations in mind: (i) establishing a knowledge base to inform development lending and (ii) ensuring this work directly supports our clients. We have also undertaken a new analysis of climate connections to the health sector. Working with leading partners in the space, like Health Care Without Harm, we have uncovered an enormous opportunity both for our own portfolio and for others designing and operating health systems. 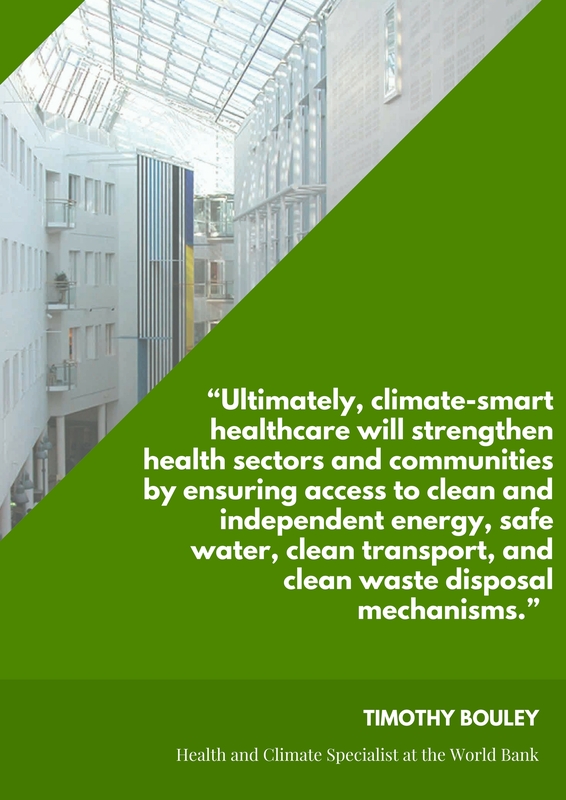 This new report, Climate-Smart Healthcare: Low Carbon and Resilience Opportunities for the Health Sector, is a first of its kind, linking climate change, the health sector, and development. It describes in-depth approaches for building and sustaining health systems that are prepared for climate change and provides tools and resources to help practitioners turn this knowledge into action. On June 27/28, report authors Timothy Bouley (Global Health and Environmental Specialist, World Bank), Josh Karliner (International Director of Program and Strategy, HCWH), and Susan Wilburn (Sustainability Director, Global Green and Healthy Hospitals) participated on a webinar during which they presented an overview of the report as well as shared tools, resources, and opportunities for on the ground implementation of climate-smart health care by hospitals, health systems, and health care facilities around the globe. (1) The report, Climate-Smart Health Care: Low-Carbon and Resilience Strategies for the Health Sector, is a joint production of the World Bank Group (Health Nutrition and Population Global Practice, and Climate Change Cross-Cutting Solutions Area), Health Care Without Harm and Mobilizing Action Toward Climate Change and Health. Six HCWH staff and senior advisers are among the nine authors.